Children most often experience nosebleeds as a result of picking the nose, according to KidsHealth.org, but this is less of a factor for adults. Adults ages 60 to 80 years old report a higher incidence of nosebleeds than other age groups, chiefly due to health factors related to aging, according to the Medical University of South Carolina. Any adult who experiences chronic nosebleeds or nosebleeds with an excessive amount of blood should seek medical attention to ensure the bleeding is not a sign of a more serious condition. An estimated 90 percent of nosebleeds begin in the front of the nose when the tissues in the septum break and bleed, according to the Medical University of South Carolina. The septum is the delicate area between the nostrils that contains a network of blood vessels. When these vessels are irritated, such as through frequent nose blowing or picking, bleeding results. However, bleeding also can come from the back of the nose. A nosebleed is rarely painful, but may create an odd, gushing sensation from the nose. Four chief causes are linked with nosebleeds, according to the Medical University of South Carolina: environmental factors, such as living in an area of warm, dry air; cold or flu and the nose picking and blowing that can accompany them; systemic conditions, such as high blood pressure, anemia or other bleeding problems; and taking medications associated with bleeding, including aspirin and blood thinners. If your nosebleed is not gushing or overly bloody, you can treat it at home. Lean forward and apply mild pressure on either side of the septum, using your fingers or your fingers covered in a tissue, according to the Medical University of South Carolina. Apply pressure for at least 15 minutes. If pressure does not work, insert gauze pads coated in petroleum jelly or decongestant nose drops. Prevent nosebleeds by using a humidifier, which introduces moisture into the air in dry conditions. 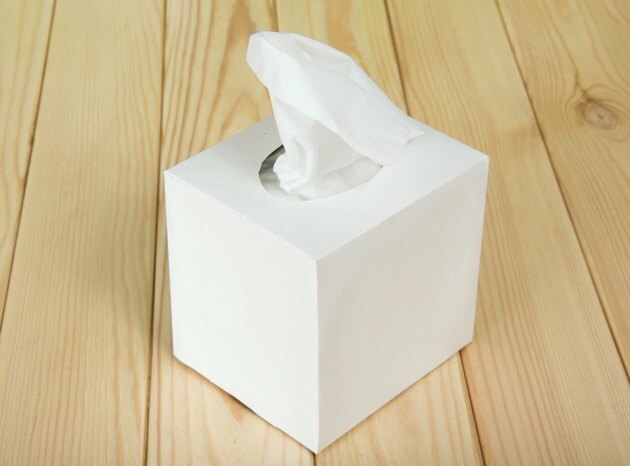 If you are ill, avoid blowing the nose excessively hard. You may put petroleum jelly on the septum to introduce moisture to the nose. Avoid taking medications linked with nosebleeds, unless advised otherwise by your physician. While many may attempt to utilize ice packs to stop nosebleeds, according to the University of Alabama-Birmingham, this treatment will not be enough to reach the affected septum. However, a physician can insert specialized ice packs that reach far back into the nose to constrict the blood vessels. If you experience a nosebleed, be aware of the circumstances in which you should seek immediate medical attention. These include if your nosebleed causes you to feel weak or faint, or if you have lost a significant amount of blood, according to the Medical University of South Carolina. Seek medical evaluation for your symptoms if your bleeding does not stop after applying direct pressure for 20 minutes, if you experience more than three nosebleeds in an hour, or if you also experience unexplained bruising or bleeding gums. If you experience chronic nosebleeds, such as more than one per week or a nosebleed on a weekly basis, a physician may be able to cauterize the blood vessels, which uses heat to seal the blood vessels and prevent bleeding, according to FamilyDoctor.org.